Science isn’t always fun and games. But sometimes it is! This guest post is by Terry Soule, a computer scientist, and Barrie Robison, a biologist, both on the faculty at the University of Idaho. The BEACON Center for the Study of Evolution in Action brings together biologists, computer scientists, and engineers to illuminate and harness the power of evolution as an on-going process. With BEACON’s support, Terry and Barrie have developed a video game, called Darwin’s Demons, where you must fight off enemies that are evolving to defeat your best efforts! Feel free to comment here. However, please send any technical queries via email to Terry (tsoule@cs.uidaho.edu) and/or Barrie (brobison@uidaho.edu). Thanks to BEACON’s support, Polymorphic Games has created the evolutionary video game Darwin’s Demons, and placed it on the Steam website as part of the greenlight process. 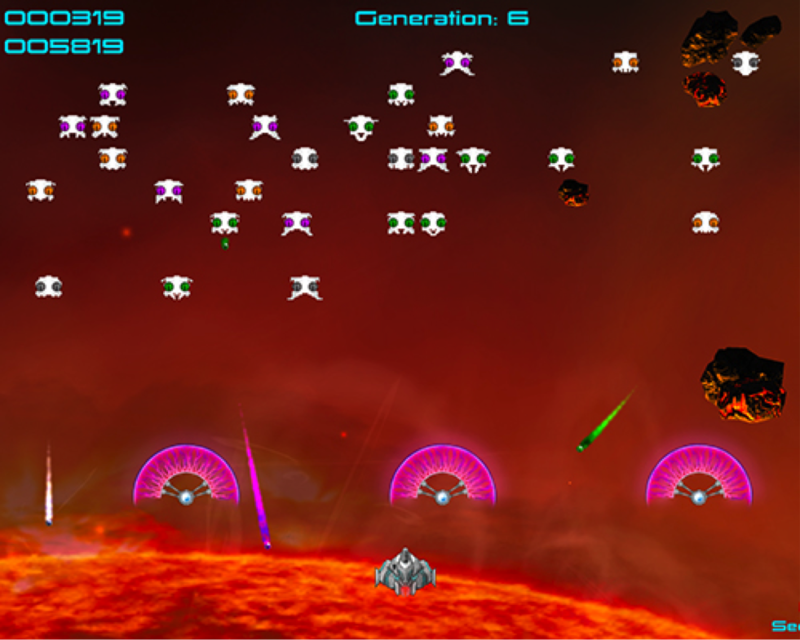 Darwin’s Demons adds an evolutionary component and modern flair to an arcade classic. Darwin’s Demons models biological evolution using enemies with digital genomes. Enemies acquire fitness by being the most aggressive, accurate, and longest lived, and only the most fit enemies pass their genomes to the next generation. The result? The creatures you found hardest to kill have all the babies, making each generation more challenging than the last! If you get the opportunity please try out the demo (downloadable at either of the sites listed above, with Windows, MAC, and Linux versions), vote for us on Steam, and send us comments, suggestions, or ideas for future directions and collaborations.